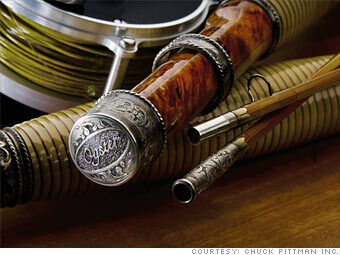 The smooth perfection of Bill Oyster's bamboo fly rods betrays nothing of the Wyoming native's chaotic path to his calling. Oyster, 37, studied art and engineering in college before dropping out to concentrate on professional bicycle racing. While training for the 1996 Olympic trials, he crashed and broke most of the bones in his torso. After recovering, he joined his in-laws' construction business in Gainesville, Ga. "My wife got used to having me around," he says. But Oyster had always loved fly-fishing. During his downtime as a cyclist, he worked as a fishing guide and gave fly-fishing lessons to balance the mental intensity of bike racing. Oyster began researching bamboo rods in 1998 and was so attracted to the material that he decided to start crafting his own rods. A year later the Atlanta Journal and Constitution published an article about Oyster's products, spurring so many requests that he decided to jump in full-time.